So I am just getting back into photography after almost a 2 year hiatus. I have never been a really technically proficient photographer, just enjoy getting out and taking photos. I would consider myself an intermediate level hobbyist photographer. That being said, I would like to improve. I took this photo two nights ago and while I wasn't really putting a ton of effort into it, would be interested in hearing about what others would have done different. I PP'd in lightroom. Looking for constructive feedback so I can learn. Thanks in advance! I would say the reflection is completing with the bridge a the primary subject. Crop off the bottom third and the feel changes. I like your idea. Hopefully you can try this again with various compositions. Thanks Lake! I will give that a shot! There is a lot going on in the picture, probably too much. My eye couldn't settle on one feature. Cropping out a lot of the extra stuff would help a lot. If the water was calm the reflection would be an interesting contrast, but it just muddies up the image as it is. Great subject though. Nothing's critically sharp. I expect that's because this photo was shot at one second shutter speed, hand held, on a moving boat. Am I correct? Handheld on a pylon at the edge of the water, but yes, i agree with it lacking sharpness. Thanks for the feedback. Do you have a particular area you would recommend focusing on? Outside of trying to capture as much of the span of the bridge as possible, I wasn't sure where to concentrate my focus. One of the reasons I posted in here so any suggestions are welcome. I would have used a tripod, ISO 100 stopped the lens down to f 16 (for starbursts) and as a result increased the exposure time. Also I would have considered using a ND filter to increase the exposure time even further. This would render the water smoother and should give some interesting reflections. To begin with, focus on your point of interest. In this case the bridge. If you don't have a tripod then improvise. Use the pylon to rest the camera on and use the timer function or a remote release . Just be sure not to drop it! I think you have a good subject and the time of night was good -with the light being just right- so go back and try taking some more shots and see how you go! I would really like to see you WORK this subject until you are happy with it! My only critique on this might be to favor the water a bit more than the sky, there is much more color in it and nothing is happening in the sky. Very well done for a try. I could second BigDave for favoring the water instead of the sky. FWIW, the best advice I ever received was to always abide by the rule of thirds; unless I choose not to. It's not intuitive. People naturally focus on interesting objects by putting them in the center of their view, whereas when viewing a photograph, prefer it composed per the rule of thirds. It's something to remember going forward. It's interesting that the advice you received to favor the water more seems to contradict the advice to favor the water less, but both put the bridge in a better 3rd position of the photo; consistent with the rule of thirds. Personally, I like the idea of moving the bridge up (favor water), increase bridge sharpness (higher f stop) and decrease water sharpness (longer exposure). I do like the reflections but at the same time I think they do tend to dominate. 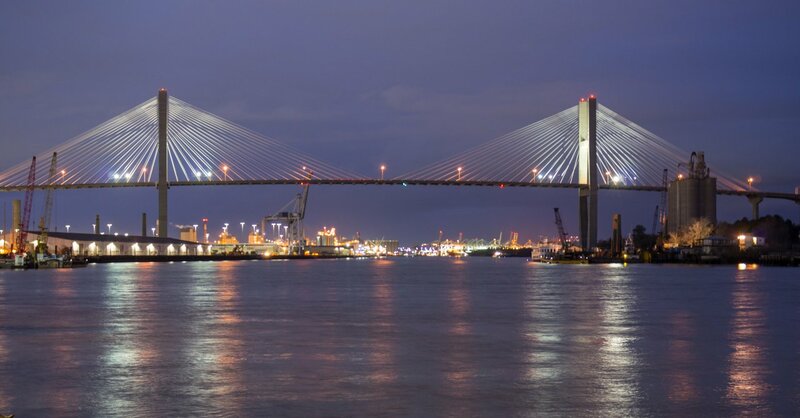 I would suggest respectfully to trim some of the lower portion of this image to give the bridge the prominence it deserves. NO! The reflections are the best part of this image!! The scene is the feature; cropping stuff out reduces the picture! I think it would look good in a panoramic orientation, The reflections would still show in the water, and the sky would also lose nothing. This is just right, in my opinion.